Can A Label Guarantee 'Humane' Treatment? On New Year's Day, California's Proposition 2, passed seven years earlier, took effect. 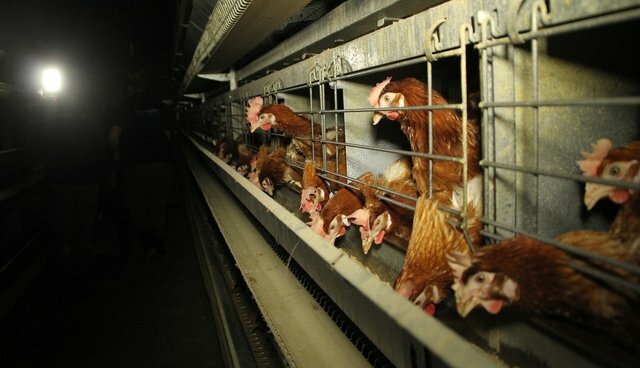 It bans certain types of confinement for farmed animals, such as gestation crates for pigs and battery cages for egg-laying hens. Companion legislation prohibits the sale of animal "foods" produced using such methods outside of California. One week later, on Jan. 8,, the grassroots animal liberation network Direct Action Everywhere (DxE) released its year-long investigation into a California "Certified Humane" egg farm, Petaluma Farms, a supplier to Whole Foods. They found horrid conditions, including de-beaking and birds covered in excrement. They also conducted an open rescue of a hen near death, who they named Mei Hua and nursed back to health. "Certified Humane" is one of the highest animal welfare ratings, requiring higher levels of welfare than Proposition 2. Meanwhile, in the meat department, Whole Foods is known for its five-step animal welfare rating system, which purports to provide increasing levels of welfare for animals raised for food, while they are alive. As the popularity of "humane" animal "food" grows, and as corporations increasingly paint themselves as the good guys for selling such products, DxE's investigation shows it is time to shift the debate. It is time to start asking the question: why not use a one-step animal welfare rating system? Let them live.